Missoula, Montana is an active university town rich in character set in the midst of stunning scenery. The city lies at the hub of five merging valleys and surrounded on all sides by mountain ranges. The Clark Fork, Rattlesnake, and Bitterroot Rivers converge near the city center, where the streets are lined with historic buildings and residences from the National Register. A short distance in any direction leads to national forests and wilderness areas. Outdoor activities abound in the area Now in its fourth edition, Day Hikes Around Missoula, Montana includes an excellent collection of 102 day hikes within a 100-mile radius of the city. While many hikes are located within the city itself, most are found in the surrounding valleys, mountains, and national forests. Destinations include both popular and remote trails, from easy nature walks to high-elevation overlooks with expansive vistas across Missoula and its mountain ranges. 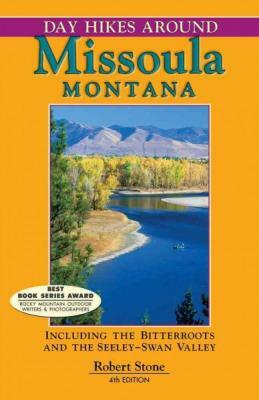 Highlights include several dramatic waterfalls, stream-fed canyons, fertile valleys flanked by mountains, hot springs, suspension bridges, and historic sites from the Lewis and Clark voyage.The author has written extensively on Montana hiking trails and has personally hiked all of these trails. The author's other Rocky Mountain hiking guides include Day Hikes Around Bozeman, Day Hikes In the Beartooth Mountains, Day Hikes In Yellowstone National Park, and Day Hikes In the Grand Tetons. The majority of Stone's 24 hiking guides are in their 3rd, 4th, or 5th editions. Since 1991, Robert Stone has been writer, photographer, and publisher of Day Hike Books. He is a Los Angeles Times Best Selling Author and an award-winning journalist of the Rocky Mountain Outdoor Writers and Photographers, the Outdoor Writers Association of California, the Northwest Outdoor Writers Association, the Bay Area Travel Writers, and the Outdoor Writers Association of America. Robert has hiked every trail in the Day Hike Book series. With 24 hiking guides in the series, many in their fourth and fifth editions, he has hiked thousands of miles of trails throughout the western United States and Hawaii. When Robert is not hiking, he researches, writes, and maps the hikes before returning to the trails. He spends summers in the Rocky Mountains of Montana and winters on the California Central Coast.